The Lumia 735 is built around a 4.7" ClearBlack AMOLED display. It has 720p resolution resulting in a pixel density of 316ppi. On top, it's covered with a protective layer of Gorilla Glass 3. The capacitive touch sensor on the display features the supersensitive touch technology that allows it to detect fingers even through gloves. The Lumia 735 comes with the Lumia Color Profile option in the settings, which gives you two sliders to play with - one for color temperature (which spans the cool, neutral and warm range) and color saturation (natural to vivid). It's a nifty feature to have on a midrange device. 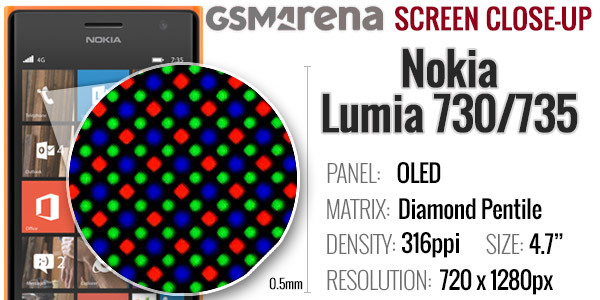 Sadly, the Nokia Lumia 730/735 doesn't have the cool Glance Screen feature. We aren't sure of the reasons behind the omission on Microsoft's side, but it would've made great sense considering the ClearBlack OLED display. The viewing angles are solid with only a minor shift in contrast when viewed at an extreme angle. Color rendering is also great and, as an added bonus, you can tweak the white balance and saturation to your liking. Contrast is great due to the AMOLED panel. The ClearBlack tech does help minimize reflectivity, which means that the relatively low brightness doesn't hurt the outdoor performance at all - the Lumia 735 is among the best in bright light. 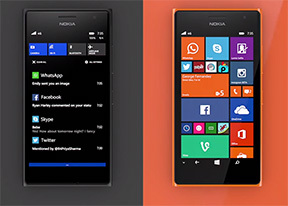 The Nokia Lumia 735 has quad-band GSM/GPRS/EDGE support, quad-band 3G with HSDPA and tri-band LTE. The Lumia 730 has the same except it swaps the LTE radio for dual-SIM support. In terms of local connectivity, it offers dual-band Wi-Fi a/b/g/n with DLNA and Wi-Fi Hotspot, and stereo Bluetooth 4.0, with file transfer support. The Wallet app also uses NFC connectivity. Unfortunately, we won't know whether that has any potential to expand beyond its out-of-the-box functionality for at least a few more months. NFC is still useful for file sharing and it works across other platforms with NFC support. Sending a picture to a Samsung phone, for instance, wasn't a problem and the same goes for web pages. NFC also plays nice with some cool accessories - like the JBL PowerUp speaker that automatically starts playing when you place the Lumia 735 on it - and charges the phone too, while at it. 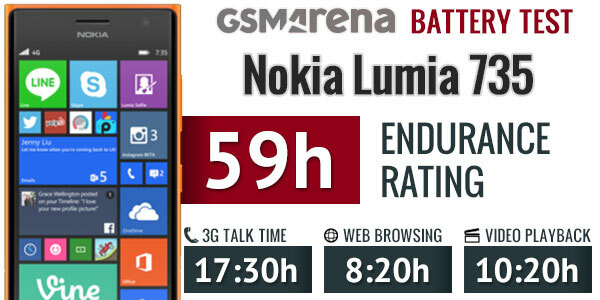 The 2200mAh Li-Ion battery inside the Lumia 735 is rated at up to 17 hours of 3G talk time and 600 hours of standby. It's a tad larger than a potential main competitor's, the Moto G.
We ran our usual battery tests including web browsing, calls, video and standby. The phone managed an overall rating of 59 hours, which means it will last about two and a half days if you do an hour each of watching videos, browsing the web and making calls each day.